It's been a while since we last posted, but we've been busy with both fun stuff and not-so-fun stuff. First of all, the weather has turned gorgeous (except that 93-degrees yesterday; not ready for that yet) and we've been able to take an untethered Blaise outside a couple of times. There will be pictures on the photo site soon. The trip is so much easier without Ike the IV pole, even if Ike is a big improvement over Fred, the last IV pole. Blaise's cuteness has been exclaimed over in at least 5 languages now and she gave a fantastic smile to a very old, very sick lady. In spite of the better efforts of road crews in both Boston and Cambridge, we made the pilgrimage to Ikea this weekend to pick up some more furniture. We are now ready to assemble a crib, a changing table, a wardrobe, a small table and a kitchen cabinet. It's hard not to be a little superstitious about getting the room ready, but if we don't do it now, we'll have a ton of scrambling to do when they finally decide Blaise is coming home. On the medical front, Blaise is now getting most of her nutrition from milk and still gaining weight! As of tomorrow, they're increasing her feeding increases to 3 mL every other day. She's at 16 mL/hour now and doing great with it. Our current feeding target is 28 mL/hour, so, barring setbacks, she will be at that volume a week from today. We're allowed to nurse once a day now, too. Less fun stuff: Blaise's IV line was compromised over the weekend. We're not sure exactly what happened, but the day nurse came in first thing to find PN leaking out of the line and blood backing down. The two big risks with a line breach are blood loss and infection. Blaise didn't lose any blood and nothing potentially infectious actually got on the line, but we were still pretty anxious about it. They've sent a culture to make sure there's no infection and she seems okay so far, but we'd rather not repeat the experience. No big news today. We're up again on Blaise's feeds to 12 mL/hour and she's holding her own so far. I think she might be catching a cold, but otherwise, we're just hanging out. So it's time for videos! Blaise has learned to (proto-)reach for the rattles on the bouncy seat. Also, flailing her arms and legs creates a great feedback loop: the more she kicks, the more she bounces and the more she bounces, the more she kicks. This one is just to show off the coincidence of me asking if Blaise can hit the rattle and Blaise hitting the rattle. Pure luck that I had the camera on the one time out of 30 that the two events happened at the same time. 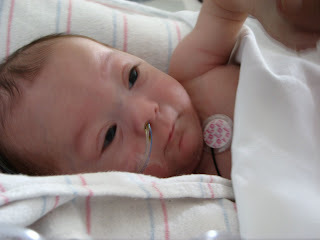 One of Blaise's nurses calls her "nosy." I was a little offended at first. How dare she call my baby nosy? Then I realized what she was talking about. Blaise absolutely must know what's going on. When she's up on your shoulder, she's always looking around, sometimes craning her neck to see out the door (even when there's nothing there). When we take her for walks, she looks into every room we pass and just generally seems to be keeping an eye on everyone. It's probably a good thing she can't talk yet. 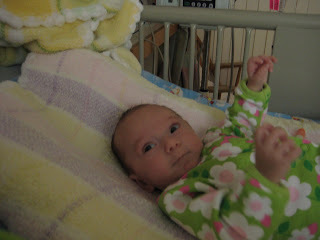 She is up to 10 cc/hour on her feeds and now gets 4 hours a day off the IV (but 2 of those are still on the g-tube). She holds her blood sugar steady as can be and even seems to be gaining weight well, which are both good signs. We had a great talk with her nutritionist yesterday about what we're expecting her to tolerate and what our goals are, as well as the logistics of weaning PN, fortifying breastmilk and supplementing with formula. Blaise is still very small for her corrected age (3rd percentile for weight and 10th for length), but at least she's on the percentile curves and they have a plan for catching her up using milk instead of PN when that's possible. It's nice to know the plan and the potential roadblocks going in so we can be prepared. Fortunately, those big toothless grins make the whole thing much more fun. Why is Blaise short gut? Answer: Because a giant meconium cyst formed in her small bowel while she was in utero, causing the intestine to twist on itself and cut off its own blood supply. Why did she have a giant cyst in her small bowel? Answer: Who knows? Someday, Blaise is going to ask us why this all happened. It's an appropriate question for any kid with a chronic condition. Most of the time the answer is genes or environment. In utero meconium cysts are often caused by Cystic Fibrosis, a less-rare-than-you-think genetic disorder. We knew from prenatal screenings that I am not a carrier of the 100 most common CF mutations. We knew that Blaise also did not have any of those mutations and yesterday, we confirmed via a sweat test that Blaise does not have a rarer version of CF. We are Cystic Fibrosis free. Hooray for dodging a second diagnosis! So now what? No CF. No malrotation. No known infection. Not, from what we can tell, genes. Not, from what we can tell, environment. Just bad luck. Not much of an answer, but there it is. New pictures are up! There is one album of cute baby pictures (like the above, in which Blaise is flirting with herself in the mirror) and one for pictures of her room at home, which we will update as we make more progress there. Enjoy! Yesterday we got to do something that we haven't been able to do since the day Blaise was born: We got to hold her without any lines. Post-op, a big question is whether we can get Blaise to the point where she needs either less IV nutrition (fewer hours a day/fewer calories delivered by PN) or if we're lucky, none at all. Before we do too much work trying to decrease her dependence on PN though, we need to make sure that she can keep her blood sugar under control without it. Since she was born, Blaise hasn't really needed to worry about that...her blood sugar was kept stable because her nutrition team kept it stable via the IV. Now, we have to see if her body can do that on its own. Yesterday afternoon was an exciting first step towards figuring this out. Blaise's PN was shut off for two hours and her nurse did two blood tests to see how her blood sugar was doing (the answer was that it did quite well, nice and stable throughout). The extra-cool part of it all was that one of those two hours was a "bottle hour" during which her g-tube feeds are shut off and she gets her 8cc/hour from an 8cc bottle. With no PN and no g-tube feeds, we had almost a full hour of Blaise completely untethered. We could spin around, dance around the room, or go for a walk around the floor without the IV pole, and we did all those things...twice. I have to be honest here. It was weird. I didn't realize just how much I'd incorporated the lines and the IV pole into my "body image" of Blaise. The only thing I can relate it to is the feeling I get early in Spring when I can finally go outside without a heavy coat. Maybe this is just me, but hanging up the winter gear usually leaves me feeling a bit like I forgot something the first day or two. This was kind of the same thing. I kept looking for stuff that just wasn't there...nothing to get tangled in, no need to worry about where clamps were or if I was leaning on a port, just a cute baby (who clearly didn't get what the big deal was). Anyway, it was awesome. She did great, which also means now we'll be doing this routinely to start the process of trying to wean Blaise off of TPN. We'll be sure to keep you all posted as we keep finding out what she can do. In other news, the weekend also saw Erin and I (with MUCH assistance from our friends Kate & Andrew) take a big step towards getting things ready for Blaise's eventual homecoming! Her nursery, which had previously been our "office" (or "room with random junk that the cats have taken over") now has a wood-laminate floor that is a lot more inviting than the grungy linoleum tile it's had for years. We'll post before-and-after pictures soon, but for now just trust me...it looks a lot better. It's hard not to be a little superstitious, so we're definitely pacing ourselves as far as getting her room ready goes. It's a funny trade-off: You want to be prepared, but you don't want to get too psyched up in case there's a setback (which there still could be). The floor really sets the stage for the whole nursery though, so many thanks to Kate & Andrew for helping us get it done. OK, pictures to follow soon! We still need to transfer pictures and videos from our cameras, but you can see some that Ben's folks took this weekend here. Here's one of Blaise looking much perkier than she did immediately post-op (and Ben looking a lot like his dad). The first piece of big news is that Blaise has doubled her birth weight and is now over 3.5 kg. This means she's outgrowing the newborn sizes! It's a little sad to have some of our favorite outfits be a bit too small, but it's great to have a nice armful of baby to cuddle. As I mentioned last time, we've resumed feeds and Blaise's team is very optimistic about her ability to process food. Right now she gets 4 mL/hour, mostly by the g-tube, but every third hour we shut off the g-tube and give her the 4 mL by bottle. The plan is to go up by 2 mL/hour every other day and eventually start turning down her PN to see whether she can gain weight from the milk. We were actually shocked by how optimistic the doctors are about feeding, so shocked that we're not telling anyone what they said, lest we jinx it. In short, they're talking about getting her off PN much, much sooner than we would have expected. The plan we had discussed pre-op was based on the assumption that they wouldn't find enough extra small bowel to save and that Blaise would lose her ICV, if she had one. But, as her surgeon said, Blaise changed the game. This new plan all depends on her ability to tolerate the feeding and to absorb enough calories from the milk to gain weight appropriately, so we're remaining cautious in our optimism. We're sure we'll hit some roadblocks, but patience hasn't failed us yet. We're back on the floor, this time in a huge private room perfect for dance parties. All of the extra tubes are out and we're down to the regular g-tube and the PICC. She's off all pain medication and doing quite well for it. We've had a lot of out of town guests over the last couple of weeks and it's nice to have some quiet time with Blaise. The newly reconnected bowels seem to be working very well. We started feeds yesterday and she's doing great with them. Already her stool is starting to look like normal breastfed baby poop. She's been having some problems with gas, which isn't really surprising, as her gut is waking up and starting to do its thing. The doctors and nurses all seem very pleased with how she's doing. Her surgeon used the word "awesome" and a nurse said "I'd say it was amazing, except it's Blaise. We should have known." Blaise is, as always, lots of fun, too. She's very smiley and alert. It's kind of funny when the doctors come to talk to us because, if Blaise is awake, she looks very intently at whoever is talking. One of them started making eye contact with her as much as with me. She's also worked out that if she hits the rattle we hold over her head, it will make a noise. I underestimated how rewarding she would find that. More pictures, soon, I promise. We've been a little busy! First things first...I promised photos, and we don't want to disappoint. Here's a picture of Blaise enjoying some new bunny slippers that arrived with her pre-op visitors. I think Kathie and Maureen were going for a puppet-show sort of routine, but I like to interpret this picture as an attempt to develop her kung-fu. Not too shabby for just having had major abdominal surgery! The tube that you see there is the N-G tube they put in to help drain her stomach after surgery. Not the most flattering accessory, but happily they removed it this morning. Blaise had a comfortable night with the tube clamped, which suggests that her body's dealing with that drainage adequately on its own. Very promising, and nice to have her back to her pre-op state as far as lines go. Besides the fact that fewer lines is just generally more comfortable, it looks like Blaise is also good to get transferred back to 10 East today. We're still waiting on getting her a bed lined up and having orders officially come through, so it may be a few hours, but she's recovered enough to head back upstairs. Erin was talking to some of her old nurses yesterday and they're looking forward to having her back. I guess a few of them were a little concerned that she hadn't left the NICU yet, but Erin made sure to tell them that Blaise is doing great. My parents are just now arriving in Boston for an Easter weekend visit, so I imagine we'll have some more pictures to post soon (hopefully from a new room). Blaise came out of surgery on Monday replete with tubes (although NOT a breathing tube; they were able to remove that in the OR). We've spent the last couple of days watching them come out: no more arterial line, no more secondary IV, no more epidural, no more urinary catheter. She still has her NG-tube (through her nose and into her stomach) and her g-tube and PICC line (the big IV in her leg). The g-tube and PICC are old "friends" and we'll have them for quite a while longer. The NG-tube should come out tomorrow, preferably because a nurse or doctor removes it, not because Blaise takes it out on her own. She's off the morphine and her only pain medication right now is occasional Tylenol, but she seems comfortable. She has also shown us that yesterday's poop was not a fluke with several dirty diapers. With the epidural out, we should be heading back to the regular floor soon. The NICU is fine, but there's no privacy at all and it's really noisy and bustling a lot of the time. Not a great recovery place for a kid who isn't good at tuning out the world to take a nap. Still, it's been fun to have Blaise's old nurses see how big and playful she is. OK, time for more than a two-word update: Blaise has indeed put her reconnected GI tract to good use and had an inaugural poo. I never thought I'd write those two words next to each other, but there it is, folks. Inaugural poo. I'll spare you all from further details, although anyone who cares to know more is welcome to ask...others already have, and we swear won't think you're weird (OK, that does depend slightly on what you ask us). The point is that this is what we were waiting for, and it seems like it's happened a few days early. I remain a paranoid dad, so I couldn't help but ask her nurse if we were sure this was a good thing. Anything unexpected strikes me as potentially worrisome, so it was nice to hear that her surgical team was "thrilled" that her intestines began waking up ahead of schedule. "Pervasive return of bowel function" was the phrase her day nurse used to describe Blaise's progress to the night shift nurse, which was pretty cool to hear. Besides the actual direct evidence, her nurses were listening to her belly throughout the day and heard some good gurgling noises that indicate everything's coming online. We're still thinking of this as a nice first step, of course, since Blaise still has a lot of healing to do. This is also a brand new physiological function she's got to get accustomed to, so there may yet be some bumps in the road. For now though, it's exciting that her body seems to be taking it's first steps towards working it out. 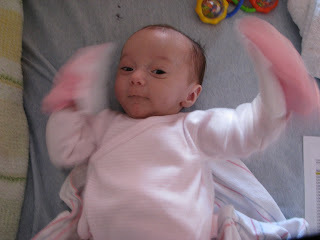 Besides that rather big update, she continues to do well in the NICU. Still some discomfort, but she's responding well to Tylenol and getting fewer doses of morphine (at a fairly low dose, even). Still within the realm of what her team expected and not interfering with her interest in being talked to and played with. If anything, I think she may be a little frustrated that she can't do more right now. We're still going to be on 7 North for another few days, but hopefully it won't be much longer before she's back upstairs...10 East is just a bit more conducive to hanging out and playing, and I think Blaise will be very glad when that's an easier option. We're all still doing well though and keeping our fingers crossed for continued progress. OK, that's it for now...but look for some new pictures and videos tomorrow, courtesy of Erin's mom and her Aunt Maureen. Not a whole lot to add this morning, which in many ways is a very good thing. 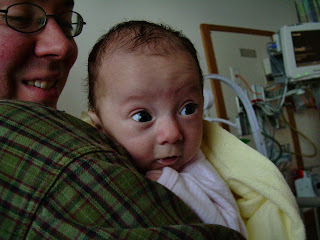 Blaise is still resting in the NICU (back in bay 3 with some old friends) and continues to recover well. Last night she was having some issues with pain management, but today they've given her both Tylenol and morphine as needed to keep her comfortable. This isn't outside the realm of what was expected, so we're really just glad she feels better. Seeing her last night was a little tough since we could tell she was pretty uncomfortable, but the pain management team is very good and she's clearly having a better day. We even got some grins out of her when we visited and she just plain looks good (a bit puffy, but good). For now, she has an NG-tube (to the stomach, through the nose) to drain bile out and a few extra IVs to deliver meds. Besides the pain medicine, she's also getting some pre-emptive antibiotics to protect her from infection. Her abdomen is still not a particularly friendly neighborhood so it pays to be careful. The puffiness is mostly from the blood transfusion she received and the extra fluids she was given during the procedure...it should subside in a few days. I think it's still hard for us to believe that the news from yesterday was so good. I'm mostly sticking to the fact that she came through it well and is recovering nicely. More than anything I just wanted her to be ok...that first surgery made it very hard for me not to think that every visit to the OR meant extreme danger. Having her come through it so well is worth everything, and the rest is bonus points. Thanks again to all of you for your support, and stay tuned for more updates. We'll be sure to keep up here as things unfold. For the first time in months, Ben and I both slept really well last night. My belly is no longer giant, our baby is no longer in critical condition and we're not staring down an impending surgery. Blaise is staying in the NICU again tonight, just to give her a little time to relax and heal before transferring back to the floor. I'll post some pictures later, but she looks great. They have her pain under control and she's comfortable, but not completely out of it. She was trying to turn to voices and gave us a little half-smile. We're not expecting poop today or probably even tomorrow. It could be up to 2 weeks. You'll hear us cheering when it happens. You, Blaise's fans, are an impressive bunch. We have code on the blog that tells us how many hits we get a day. Usually, it's between 80 and 90 total visits, with about 50 unique visitors. Yesterday it was 318 total visits from 131 unique visitors. Thank you for thinking about her and us. The 9 hours from the time they took her from pre-op and the time we saw her in the NICU were about 8 hours and 45 minutes too long. If you, like me, are a stress-eater and you know you're going to be stressed, make sure that the only food you have around isn't a bag of mini Reese's cups. Children's is a great hospital and, as they go, a fairly cheerful one. The surgical waiting rooms, however, are hell on Earth. Surgeons, for legal reasons, aren't the most optimistic bunch. A big thumbs up from the surgeon as he came to talk to us was a great sign. Our friends Kate and Andrew are amazing to us. But, Andrew, if we say not to wash our dishes, I feel that implies "And you don't have to empty the litter boxes, either." Thank you for all of your help so far. Both the Royals and the Red Sox opening games were postponed yesterday and UNC won the NCAA tournament. Lousy day for sports. Great day for us anyway. First, Blaise did beautifully. The surgeon said that she "never turned a hair" and she was off the ventilator immediately. Her vital signs are all good. She looks great, a little puffy from the extra fluids and still dazed from the anesthesia, but doing really well. She was sent to the NICU at least for the night, but she's in great shape. Of course, we expected nothing less of our little champ. Now the news. We were a little off in the previous post about her PICC line. They didn't move it to the other leg; they just repositioned it in different site on the same leg. Keeping PICC sites healthy is a huge thing for a kid who might need the line for a while, so it's great that they can keep using the site. They did take a biopsy of her liver, just to be on the safe side, but it looks healthy in the opinion of the surgeon. The results of the contrast study were confirmed. She has her entire large intestine, apparently intact. She has an intact ileocecal valve (the one between the small and large intestine) and hanging off the end, they found 26cm of apparently viable small bowel. They also found a stray piece of apparently viable small intestine just hanging out and the piece that we knew she had has grown. Her previous measurement was 20 cm of small bowel from the base of her stomach (the pylorus) to her ostomy. That included her whole duodenum and a piece of jejunum (about 10-12 cm). Her current measurement of small bowel is 45 cm from the ligament of trites (at the end of the duodenum). That includes both jejunum and ileum. When duodenum is added in, it's more like 60 cm. She has all three types of small bowel tissue, an intact ICV and her entire colon. Her ostomy is gone; the feeding tube remains, and will for a while. We still have a lot of work to do in terms of rehabilitating her gut and getting it to do the job of a full-sized small bowel, but this news is as good as we could get and much better than we had dared to hope for. Her surgeon had previously estimated that she had a 1% chance of coming completely off the IV nutrition. He's now saying she has a 75% chance. Now what? Well, the short version is that we wait for her to poop. Once she does, we'll have an indication that her bowel is functioning and then we'll start feeds. We have to remain a little guarded because there is still a possibility that some portion of her bowel won't function or that the sutures won't hold or any number of other things, but this really is the best news we could have had today. She's in the NICU for now, a little uncomfortable, but doing well. The next few days are likely to be full of updates and we'll try to post as they come up. We want to thank all of you who read regularly for your support and thoughts today and over the last few months. All three of us have a long way to go, but knowing that so many people are cheering for Blaise makes a world of difference. They're just closing...we're heading over to talk to her surgeon in 30 minutes. We're waiting for another call any minute now, but our last update was that Blaise is still doing very well. I had the chance to talk with Dr. Duggan (one of the GI doctors on Blaise's care team) who was looking in on the procedure for a while this afternoon. He says the intestine looks good and when I asked about the amount of distal small bowel (stuff attached to the large intestine that we haven't seen yet) he said that there seemed to be "more than expected." OK, this is potentially good, but no one should start doing backflips yet. We still don't know if they think it's enough to try keeping (along with the ileocecal valve) and depending on how things go, Dr. Weldon may want to give Blaise a new stoma to protect the tissue that we know works correctly. No idea how much longer...I feel like we have to assume a few more hours, but Blaise remains stable and slow and steady has worked for us so far. A quick update: So far, so good. Thus far, Blaise has had her central line moved to her other leg. You might remember that we weren't able to get blood drawn from the original line as of about a week ago, so she was due for a new line in. Honestly, it's pretty great that she went this long without an infection or a blood clot...this swap is mostly due to her having grown a lot since her first surgery. They began working on her abdomen around 1pm and her doctor called the surgical liaisons at 2:30 to say things were "going smoothly." We haven't heard more than that, so that could mean that they're still working through scar tissue or that they're getting ready to put things back together. We'll put up more news as soon as we've got it. Sorry it's a bit small...Erin managed to catch Blaise mid-smile with her cell-phone camera and sent it my way while I was in Denver for a conference. Totally made my morning. So...one more day. We've got a hotel room next door so we can stay here as late as we want tonight and not have to leave tomorrow. Monday is opening day at Fenway Park and we both had visions of getting stuck on the T while a million drunken fans poured onto every subway car. I think my head would actually explode under those circumstances, so the Longwood Inn it is. What does today feel like? I guess it's no surprise that it's hard to find the right words. The closest I can come is to try and articulate a feeling I've had many times before, but never so much as today. There's an expression they taught us in French class when I was in high school: "L'esprit de l'escalier." We learned (with apologies to our Parisian readership if this is all wrong) that it meant the "Spirit of the Stairwell" and referred to a spirit who whispered to you all the things you should have said in the conversation downstairs while you were on your way upstairs to your bed for the night. Whether it's really a French expression or not, it gets something very right in my mind: Too often we know what we should have said too late. That doesn't quite describe where I am today, but I think it's related. Many times when I've been facing something big, I have this feeling like I already know I can't say enough to the people around me. It's like there must be some way to talk about the importance of what's happening, but I know I'm not up to it. I can't stand this feeling. I hope my parents don't mind me saying this, but one of the worst cases of it hit me when Mom and Dad dropped me off at MIT for the first time. We had breakfast somewhere in Cambridge, they drove me to the dorm I was living in for the first few weeks, and then we said goodbye. Needless to say, that's a big goodbye, and that whole morning I just couldn't figure out how to make the most of those last few hours we were going to hang out together. I wanted to say something important...something bigger than just saying thank you or telling them I loved them. But what do you say? What's going to capture all that extra stuff without just sounding trite? The answer, of course, is that nothing will...I've come to believe that some things are just a bit too big. The morning my parents left, I thanked them and I told them I loved them, and I hoped like hell it was enough. Today and tomorrow morning, I figure I have to do exactly the same thing for Blaise. This feels a lot tougher, though. Part of it is the enormity of what happened the day she was born, part of it is how hopeful and scared we are for tomorrow, and the rest of it is that Blaise is smart, but she's not talking yet! Words aren't really the language we use right now...I know she can tell we love her and that we're proud of her, but I also imagine the Spirit of the Stairwell hits you even harder when you couldn't really count on words in the first place. I wish I could tell her what was coming. I wish she knew how brave and incredible we think she is. I wish she could really know how many of you are out there thinking about her. I promise I've told her...I've told her a hundred times at least. I just hope it came across, and I don't know how I'll know if I've ever said enough. Sorry if this was long...when I don't know what to say, I sometimes say too much. Thanks to all of you for your kind words and for keeping Blaise in your thoughts. I can't wait to tell you all how things go tomorrow. The night before Blaise was born, while Ben tried to sleep on the fold-out chair in our room at the Brigham, I watched the DePaul men's basketball team lose to Notre Dame. I was trying to not think about what the perinatologist had said to us a few hours earlier: "I've been doing maternal-fetal medicine for 25 years and I don't know what this is." File that under Things You Never Want to Hear a Doctor Say. Watching sports is good for not thinking about big stuff. You just turn off your brain and watch the ball. Fitting, then, that Blaise's surgery is on Opening Day and the day of the NCAA men's basketball championship game. We're both nervous and excited for Monday. Hopefully, the surgery will mean no more ostomy, which would be nice because her stoma is in a funny spot and the bag for catching stool falls off at least once a day. We've done as many as 5 bag replacements in a single 12-hour shift. Not fun for anyone, especially Blaise. But, of course, surgery brings with it a lot of risks and we can't help but be nervous about them. There is also the possibility that Blaise will come out of surgery with another ostomy, since they could find unattached small bowel and want to be darn sure it works before connecting it up. So this surgery should make things easier, but if her surgeon feels like it's necessary to get "creative" (his term, not mine), it might be a little more complicated for a while and we could be facing another surgery. Blaise, of course, has no idea that any of this is going to happen, which makes life easy for her, but a little hard for us. I'd like to be able to explain this to her and warn her that she's going to feel pretty lousy next week, but that it will get better. At least she won't remember it. She continues to charm everyone who meets her. More than one volunteer has commented on how fun she is to play with and she's becoming very interested in what's going on around her. That's a bit of a problem because she doesn't want to nap during the day: too much to see! She's also weighing in at a whopping 7 lbs, 4 oz and taking half an ounce of milk by mouth every 4 hours, in addition to 7 mL (about a quarter ounce) every hour by her g-tube. No problems tolerating that amount so far. She'll start back at baseline (1 mL/hour by g-tube; nothing by mouth) after the surgery, but she'll work back up. Gran and Aunt Mo are here until Wednesday, so lots of extra adoration coming her way.